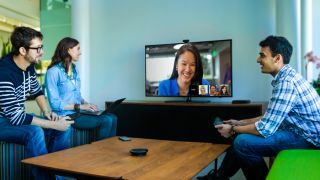 Google has added a new plugin for its Google Apps suite that allows Microsoft Outlook users to easily set-up Hangouts video conferences with each other. The new integration allows Outlook users to engage in video chats directly from their Mail or Calendar applications, providing they have Google Apps open in the background. The Hangouts Plugin for Outlook, which must be installed on Microsoft systems, will be particularly useful for those Outlook users who work from outside the office. That way they'll be able to schedule chats with their contacts and colleagues without switching between Microsoft and Google suites. Users will also be able to join live Hangouts by clicking links from within their email. The plugin will prove handy for those using Chromeboxes to schedule meetings, while in other circumstances employers will need Google Apps for Business installed. To install the plugin, users must have administrator privileges on the office computer.